Ok, so I have a thing for sunflowers. 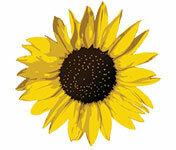 There is just something so cheerful and comforting about a sunflower. They instantly make me feel at home. I'll try to not overdo it. Oddly enough, I'm not overly successful growing sunflowers. Go figure. A shame, really, since I'm a big fan of gardens, both flowers and veggies... this may become evident as this site/blog progresses. We'll see. By day, I am a web designer, creating corporate websites with emphasis on usability and search engine optimization. Creativity is often forced into the back seat. With this little blog, I hope to get to play with a bit more abstract or artistic concepts. And, with sunflowers. If time permits. Of course, I always expected to be, and looked forward to becoming a grandmother. Just maybe not quite so soon. It turns out, that both of my children were absent when birth control was discussed at school and at home - both of them were parents at 19. While I'm not thrilled about their early parenthood, I am positively smitten with not only the kids (4 of them, now) but, with being a grandmother, too. I saw 2 of them enter this world and I cut one umbilical cord. After a 16 year, spread across 2 continents career in corporate travel, I switched gears and ended up in Web Design. Quite by accident, too. For no reason, other than to satisfy my curiosity, I went on a mission to find out. I quite vividly remember my first print out of "HTML 101". Many trees were harmed in the process. Anyways, to make a long story short, I was hooked. I created a personal website under the name of "Sunshine" and started dabbling and experimenting away. To my surprise, someone saw and liked that little website and asked me to build one for her home daycare. That was my first job.